Yesterday, August 13th, was the 1-year anniversary of my decision to stay in Blacksburg and establish Crow Forest Permaculture. The grapes are ripening on the vine. Our chickens are roaming free. The tomatoes are rolling in. Apple and pear season has come early this year. The ground hogs have retreated! And the paw paws are growing fatter on their branches. What a life-changing year it has been! Here is a review some of the month-month highlights of 2014 and goals for 2015. Advanced Permaculture Teacher Certification Course in Truskavets, Ukraine. I was blessed with the opportunity to take a “birthright” trip to the land of my heritage, all while making friends with Ukrainians who care deeply about ecological sustainability and social justice. Christina Zawerucha will be co-teaching a 72 hour hybrid Bilingual Permaculture Design Course with the NGO- Permaculture in Ukraine and Permaculture for Peace with Tatiana Chuchko and Pavlo Ardanov. Crow Forest Permaculture, in collaboration with our partner NGO Permaculture in Ukraine, has launched a “Permaculture for Peace-building” 72-hour Design Course “Permaculture Roundtable” that is being video-taped, translated, and broadcast for free online to approximately 500 internally displaced refugees in Ukraine. Permaculture design strategies will be introduced, explored, and implemented with the purpose of empowering internally displaced persons as they rebuild their homes and communities. Participants will learn practical skills, including but not limited to small-scale, intensive systems designed to generate and store heat energy (e.g. Solar ovens, solar glazing, thermal mass,) as well as provide strategies for food security (Greenhouse growing, succession garden design, food foraging, food preservation) and conflict resolution that incorporate permaculture principles. ***Please email czwriter@vt.edu if you are interested in participating. Stage-Building: Chris Piatt, Kelly Junco, Parakh Hoon, Mike Heitzman and Christina Zawerucha worked in the cold and snow to design and build a beautiful stage for our barn. We are running an official “Sauna Club” to fund the repair of our hot-tub. $50 membership gets you 5 visits to the sauna/hot tub. Participants learned how to make ginger beer. Some people learned how to make their own potting soil. We hope to run a Cider-Making workshop with local brewer Justin Martin, using our very own cider-press in October. We also hope to run a lacto-fermented pickling workshop over the winter. Ukrainian Pysanka Egg-Painting Workshop- We ran a series of hands-on workshops with Warm Hearth Community Center. We will be running a Pysanka-making booth at Gypsy fest in Rhiner on September 5th, 2014. Nouri, Junior, Parakh, Ethan, Mousa, Mike, Maureen, Tim, and Christina built a foundation and frame for our rainwater harvesting greenhouse. Please help us complete our greenhouse roof and walls before winter sets in. Scheduled for Free food provided. On Saturday, June 7th, we had an awesome “Wild Food Foraging and Korean Cooking workshop” led by my dear friends KD Palwole Jang and Roy Kim. During this fun filled evening, KD, a certified acupuncturist, Chinese herbalist and Korean Medicinal Healer took us for a stroll through the woods to discover nature’s wild abundance growing all around us. KD and Roy will lead a Fall Session of the Korean Food Foraging Workshop. Stay tuned for specific dates! Ivana Kupala Ukrainian Solstice Party- Thank you Orbit Eyes, Sovereign Goblin, and Dan Steinberg for your amazing artistic and music contributions. 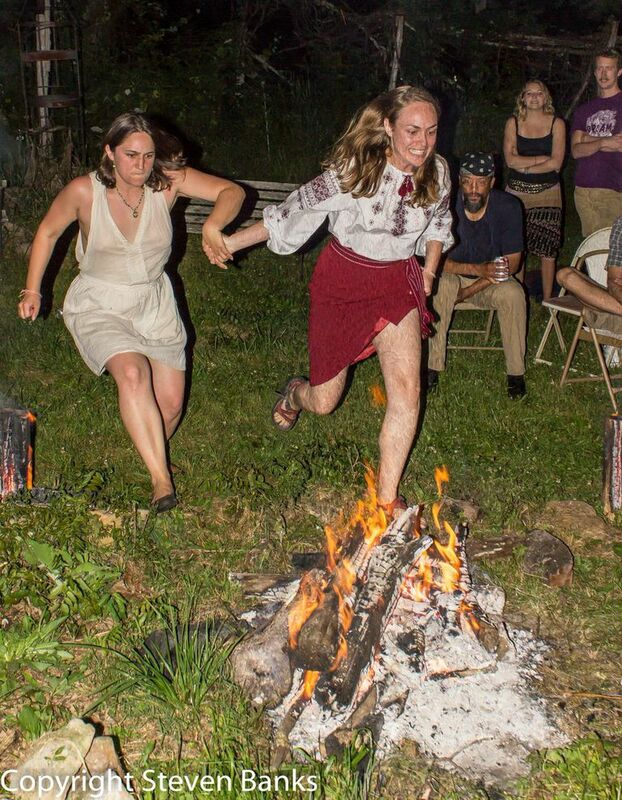 This was a fantastic party that mixed ancient traditions with new ones. Be ready to jump over the fire on June 20th, 2014! CZ shot a groundhog and shared it with the community. Master Naturalist Alex Hazzouri will lead an astronomy and Stargazing workshop at 8:00 PM on Saturday, August 23rd. $5 suggested donation and/or work-study. YOU CAN GROW THE POSSIBILITIES! Do you have an interesting skill or concept you would like to introduce to a larger community? Do you want to share culinary or ecological wisdom from your heritage? Then you may want to run a workshop with Crow Forest Permaculture. Please email czwriter@vt.edu or call 540-315-7059. Thank you!!! Deep thanks must go to my roommates Maureen, Tim, and Tom, as well as Mike, Parakh, Nouri, Junior, KD, Roy, Kelly, Chris, Kaity, Adam, Elliot, Nancy, Aissatou, Oumoule, Drew, Patrick, Seneca and all of the other loving friends who have encouraged and supported these experiments from near and far. Deep thanks must go to Crystal Cook and Edward Marshall of We Are All Farmers, who encouraged me to follow the dream here in Virginia. Thank you to Tom, Rachel, Carrie, Pete and my long-term friends who root for me from afar. Also, thanks to my family for accepting my choices, even if they do seem a little different. 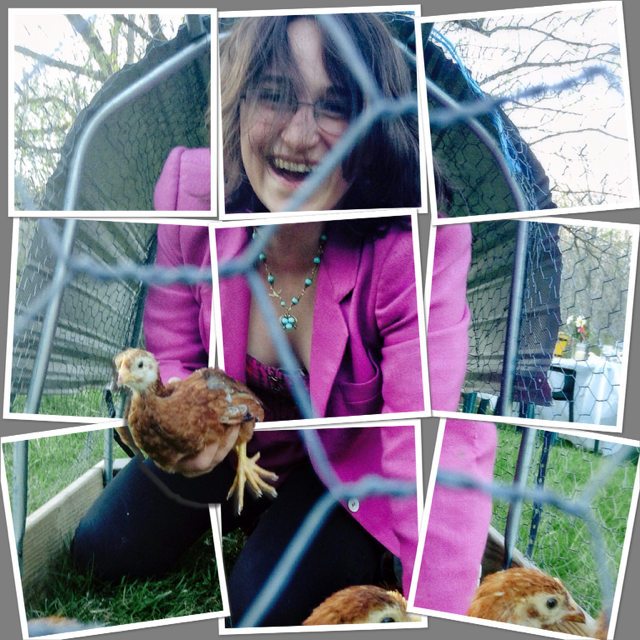 Thanks, Parakh for this funny Easter photo! I often struggle with the tension between wanting to accomplish more, and being able to simply relax and enjoy what we have built here. But I am grateful for the opportunity to grow, both internally and externally. I beat myself up for the blunders, but as I look back on 2014, it looks like the path can be retraced. I want to focus on being a better friend and community member for the second half of 2014. May we all stay true to our dreams, and blossom into our true selves. 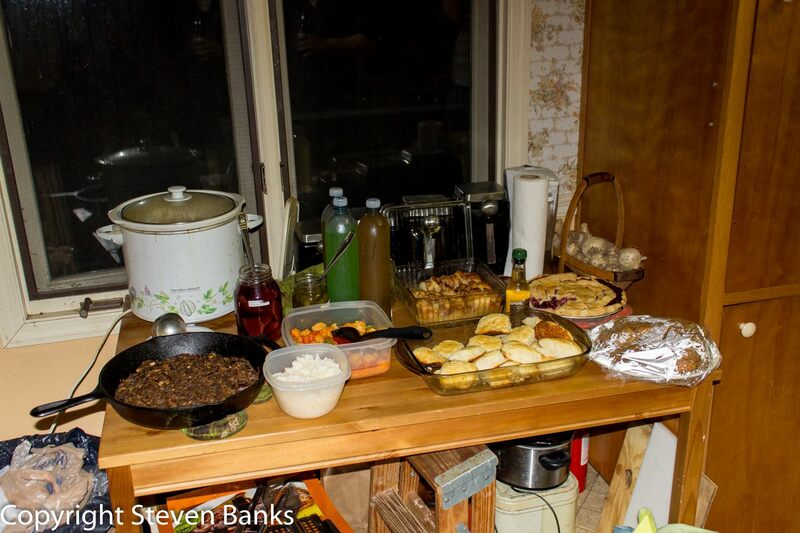 ← Wild Foraging and Korean Cooking Workshop a Success!